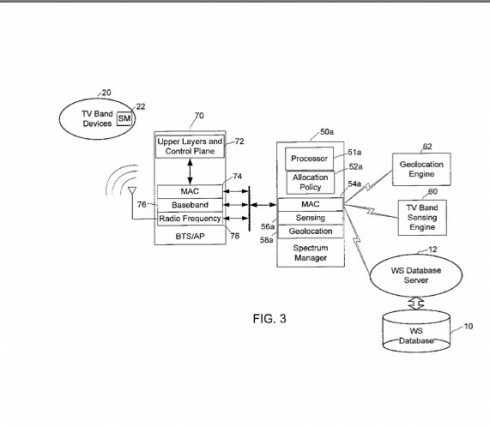 New patent application #20100309806 describes a peer to peer radio system designed to utilize the “white space” between TV channels. The system receives data from RF and geolocation sensors and processes them along with information from the FCC’s white space database to assign operating frequencies on a dynamic basis. This entry was posted on Friday, December 10th, 2010 at 4:25 pm	and is filed under documentation, RF. You can follow any responses to this entry through the RSS 2.0 feed. You can skip to the end and leave a response. Pinging is currently not allowed. I thought the whitespace is there for a reason, wouldn’t that conflict with this idea? The original purpose of white space was to provide adequate separation between analog TV channels to avoid interference. With the advent of digital TV the bandwidth of the broadcast TV signal is significantly narrower, so the white space can be safety occupied per FCC rules without danger of interference to TV broadcasters.